Optimum Anabolics - HealthLife.com - Where Health, Life and People Meet! If you're serious about building muscle then you're about to experience the ride of your life! Optimum Anabolics takes you on a step-by-step mass building journey through every single one of the "8 Anabolic Factors" that absolutely MUST be mastered if you EVER plan on seeing a scrap of new muscle! Miss out on any ONE of these important elements, and you'll NEVER reach your full potential. 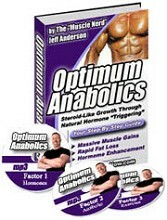 Optimum Anabolics has proven to be the ULTIMATE MASS BUILDER on the plane over and over again! The "before & after" pictures speak for themselves!